Cookie Internet Solutions | WordPress Design, SEO, Marketing. Cookie is an experienced team of creatives focused on delivering delicious websites for our clients. We provide top notch ingredients that will meet their needs and save them a little dough. When you work with Cookie you can expect friendly service, great communication, and honest industry backed input. Here at Cookie we know social media, and we know what it takes to get you to the top of search engine results. Now that you have your fancy new site what good is it if no one will see it? We are here to help increase visitors and conversions to keep your website producing fresh clients and increasing loyalty. Cookie knows that partnerships are key. The zest to success is keeping our clients pleased. That’s why we offer a variety of services to help support our partners and their projects well beyond deployment. Here at cookie we know wordpress and we know what it takes to generate leads and increase conversion. We make things easy. Basic computer know how is all you need to update your wordpress site, if you can update facebook you can update wordpress. With 20 years combined experience we know what it takes to create eye catching, lead generating design in a timely manner. We are a business as well so we know what it’s like to be getting started. Get excellent design and service without breaking the bank. We know having good relationships with our clients makes all the difference. That’s why we treat you as if you were our one and only. Something you won’t get out of those big agencies. Happiness is the key to success, and our services will put a smile on your face. We have been at this for a long time, we know how to design and test your site for maximum performance, we want you to get the most out of your site and to keep your clients coming back for more. Here at COOKIE we have had the pleasure of working with Claire Rae and her fitness program. Using WordPress we were able to create a platform where Claire is able to provide meal and exercise plans for her users as well as host competitions. This system is set up as a fitness social network with profiles, forums, videos, recipe manager, photo voting and much more. Claire has been a loyal client for 2 years now and we look forward to many more. Feel free to check out the site and maybe join the Body Makeover Movement. 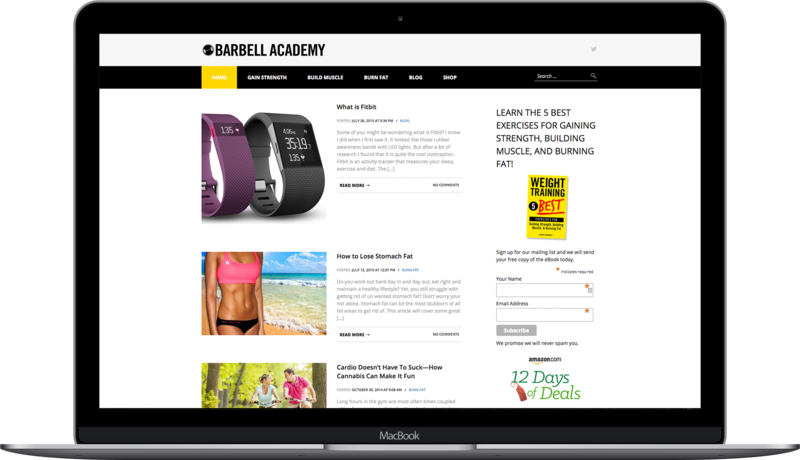 Barbell Academy is a blog about lifting weights and getting fit. Here at COOKIE we have designed a simple blog with monetization, Lead generation, SEO and Social Media Optimization along with amazon shop integration and email autoresponders. I have been working with Angel for 2 years now. He was a God send. He is always so helpful and is the fastest responder to concerns I have ever dealt with. I highly recommend him for any web based work you might have. I am very pleased with his work. Request a quote so we can start baking your design today. We value your privacy. We will not spam or share your email. © Cookie . All rights reserved.